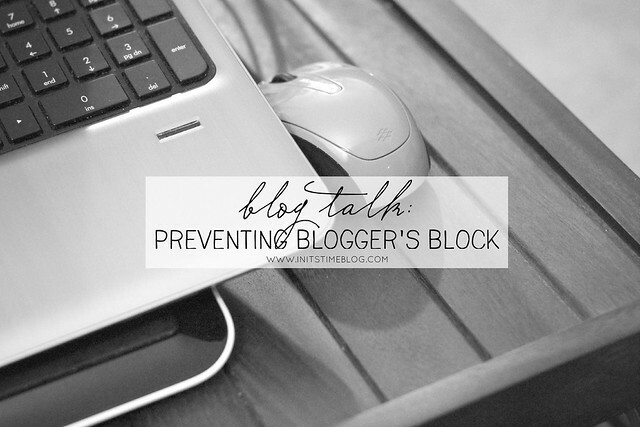 BLOG TALK: PREVENTING BLOGGER'S BLOCK. Do you ever get blogger's block? I mention it here and there on my blog and definitely suffer from it every now and then. I'll have streaks of good blog post ideas and find myself cranking them out like there's no tomorrow. Normally I blog in batches, writing up to five posts at once and then scheduling them for the upcoming week or so. 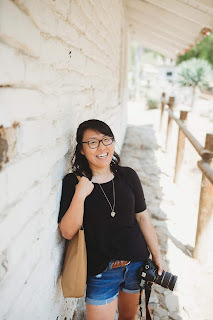 But I'll also have blog droughts, where I cannot for the life of me get a blog post written and then force myself to create a post because I like to stick to my schedule (it's the organizer in me). But I've always wondered where people get their ideas to blog. I mean, how do those bloggers come up with those amazing posts that I wish I'd written? How do they come up with content? And how do they do it without running dry? When it comes to my blog, I tend to come up with posts from real life and then I'll throw in some wishlists, fiction, and other fun stuff here and there, too. But for the most part, I get my blog post ideas from life--the experiences I have, the people I meet, the thoughts that run through my mind, or even the sermons and songs that I hear. I'll come up with ideas when I'm shopping, about to go to bed (thank goodness for post-its! ), or even walking my dog. And then I'll sit down, type them up, and schedule them to publish. If I'm really running dry, I'll occasionally look into my archives and will also turn to Pinterest for a few blog post ideas. I'll also try and keep up with my blog post series and pull out my camera and just snap away, too. Sometimes, just clearing my mind and getting away from the blogging scene helps, too. Coming up with blog posts is a weird process, especially when you want to create original content. But it's a good challenge for the writer in me and preventing blogger's block is something I'm always interested in doing. So where do you get your inspiration and blog content from? Do you get it from other bloggers, creating copycat posts? Or do you get it from real life and the everyday moments that you live? How do you prevent blogger's block? My posts tend to be real life inspirations as well. I guess there's a balance making sure I'm living and being present in in order to write about it. I have no idea how to prevent bloggers block, when I get stuck on the creative/art side I find browsing Pinterest, being outside, walking through Target (I know weird) often inspire me, whether it's a color combo or pattern etc. i relate with this post so much because blogger's block is a real thing. i've experienced it, as have other bloggers. i'm finding that writing in batches [like you mentioned] is better. Great topic! Honestly, I haven't had blogger's block in a long time. When I dropped down to only posting 2-3 days a week, it seems like I have the opposite problem: too many ideas and not enough time to post them! I guess I could fix that by posting more, but that's another topic for another day... I get a lot of my ideas just randomly while I'm out on a run or driving to work. Some of my posts have been adapted from another blogger (linking back to them as inspiration, of course), and most of the time it's just about stuff that happens to me or is going on in my life. It just seems like there's always something these days! Well, my blog isn't that old, and I'm trying not to stretch myself thin, so I only post 2-3 times a week. I have enough ideas to last me for months, and my editorial calendar is scheduled through the next few weeks. My blog is roughly (or will be once it's older than two months) divided into these categories: living (Ohio, SC, France, travel), identity (religion, feminism, politics), relationships (marriage, friends, family), and interests (books, fashion). My inspiration comes from my life. There's so much I want to write about what's currently going on in my life, and what experiences I've had in the past. Add in book reviews (I have SUCH a backlog already!) and some fashion posts (I look nice maybe once a week, and yet I also already have a backlog), and BAM, too many topics to get bloggers' block. I can so relate to that balance. I've been finding myself putting my camera down more--as much as I hate it!--so I can remember to be present and just enjoy the moment. Love that! I feel like my blog really is a place to document and save memories and adventures and everything in between (including some random posts, haha). But I really do love being able to look back through old posts and see trips and stuff captured and documented. :) And I can only imagine how your blog will continue to do that once your little one arrives!!! I love this! I'm an "everyday moments type" too. If I'm not inspired by real life things, I sometimes search Pinterest for ideas. Getting away from the blogging scene also helps! I completely agree with everything you said. :) Real life really does make for the best (or at least in my opinion!) posts out there. And Pinterest, well, has EVERYTHING, haha. Blog breaks are so important! I think it's so easy to over-work (or over-blog?) because we have constant access to our blogs/email/social media but like you said, taking a step back and un-plugging is so refreshing! i'm with you! before it was a lot of life experience...and it still is i suppose...but i think i just get inspired by what i'm reading, seeing, listening to. whether that is other bloggers, pinterest, my friends/family, strangers...what have you. writers block is HARD to get past. YES. I definitely find that I like blogging about outings and adventures and stuff but I also like to mix in random thoughts and other things I'm inspired by. I like to think that my blog isn't solely a scrapbook, but also a diary or journal, too. And I agree, writer's block is real and hard to get past!!! Haha, I totally batch wrote 3 posts on Saturday morning! I am an Educational Assistant in a classroom that is a program for children with special needs. I'm 1:1 again with a student who has Autism. Batch-writing is definitely the way to go. I'm glad you got a chance to blog-write this past weekend! It totally is! I have plans to do so again this weekend or tonight after work. Last school year, I worked in the afternoons with the little preschoolers. My baby fever has spiiiiked!